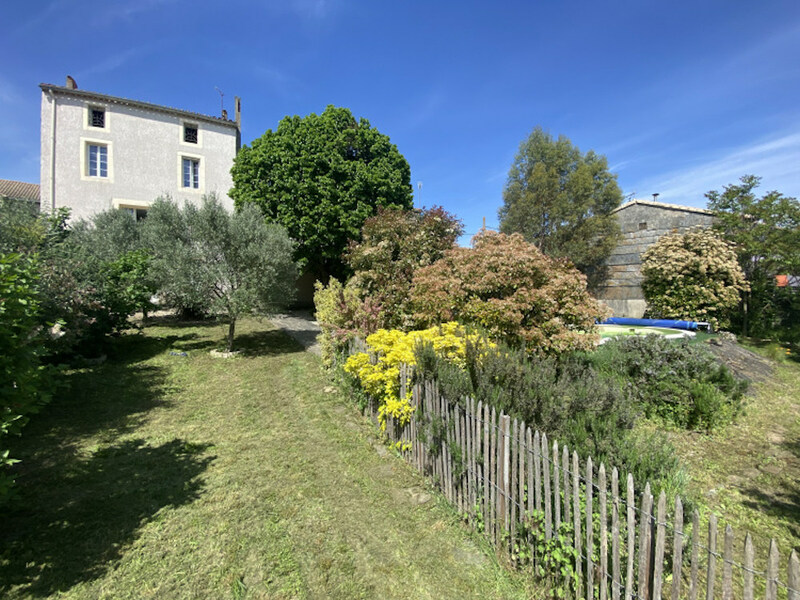 This superb detached high-class residence is set within walking distance of the bustling town centre of Locmine in southern Brittany where you are less than 30 mins drive to the coast and Vannes. A high-quality home where you will be first be wowed by the impressive entrance and curved marble staircase, marble flooring and cathedral ceiling. Comprising of 6 bedrooms including 3 with en-suite facilities and further 3 bedrooms with bathroom the home may serve as boutique B&B. Gardens and grounds extend to approx 1500m2 with terraces for dining, in-ground pool and plenty of space to entertain. On the lower level is garage parking for 4 cars, room ideal for games or cinema, utility and stores. With a gated entrance, high front wall and hedged and fenced boundaries, the home offers a very high degree of privacy, yet is walking distance to all the shops and commerce of Locmine a busy and bustling town with plenty going on year-round. Close by are numerous pretty villages to explore, lakes and wooded walks. The beaches and Vannes are 30 mins. Lorient is 40 mins. For those who need easy access to and from the UK, Roscoff or St Malo are both about 2 hours. Low cost flights go to Brest and Rennes making the home convenient for visiting friends and family. Entrance Hall: The WOW factor hits you from the moment you enter. The entrance was built to impress with marble floor, high ceiling and a sweeping marble staircase. Measures approx. 4m x 4m. Inner Hall with doors to the following rooms and stairs down to the basement area. Double Bedroom with En-suite: An impressive front aspect ground floor double bedroom with views over the gardens and large en-suite bathroom with bath, dual basins over a vanity unit with storage under, bidet and storage. Measures approx. 7m X 4m including en-suite. 1st Floor – Mezzanine landing over-looking the entrance below. Master Bedroom with en-suite: Approx. 6m x 3m with built-in wardrobes one end. Dual aspect views over the gardens and pool. High ceiling. En-suite bathroom approx. 2m x 2m narrowing to 1m with bath and basin. Double Bedroom: Approx. 4m x 4m with garden aspect. 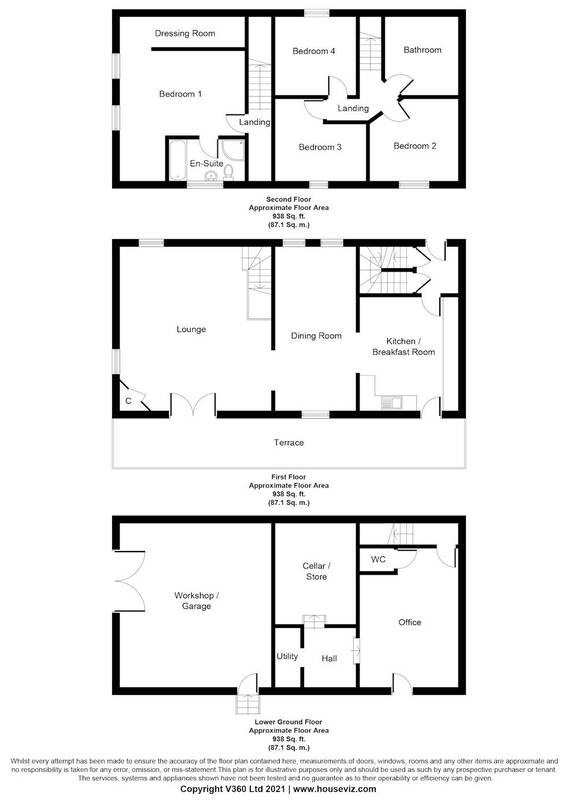 Double Bedroom with en-suite: Measuring approx. 7m X 3.5m including en-suite. Spacious double overlooking the front and en-suite comprising of bath, basin and bidet. Family Shower Room: 3.5m X 2.5m approx. with walk-in shower cubicle, basin and storage. Games / Cinema Room/ Office or Hobby Room: Large room of approx. 7m X 3m with windows to the side aspect. Utility Room / Boiler Room– with storage freezer space and plumbing and space for washing machines. Oil fired boiler for central heating. Store – Perfect for your wine collection! Garage – with light and power. 4 cars garage. Gardens / Outside: Despite being set in the centre of town, the property is afforded a high degree of privacy and comes with gated entrance, drive parking for 1 car and garage entrance. A flagstone path leads you to the front door where there is a wrap around marble terrace leading to the entrance. Gardens extend to approx. 1500m2 with areas of lawn, bedding plants rose bushes, trees and shrubbery. The property is not overlooked. 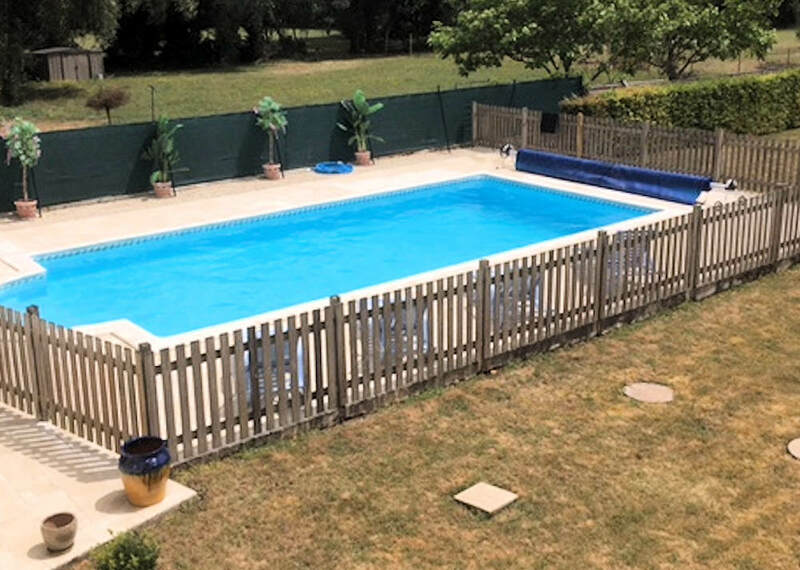 The pool is in need of a deep clean and possible refurb as it has not been used for some time by the owners who otherwise understand it to be in full working order. Around the pool is terracing with plenty of space for sunbeds and loungers. To the rear of the property is a dining terrace perfect for BBq’s and entertaining all looking over a secluded garden area. Enclosed and private the grounds are ideal for children and safe for pets. Marble Flooring | Scope for Boutique B&B | Fab Private Gardens | Walking to shops bars bakers.